My brother's dog BamBam passed on 11/2/15. I framed this to give to them when we see them Friday this week....TFL! and thanks for your nice comments! So sorry for the loss of BamBam. You, created a stunning tribute to this fur baby (typing with tears in my eyes), wonderful job, Marci!! Oh, I am so, so sorry :( This is a beautiful page that brought me to tears. I feel for your brother and his family. 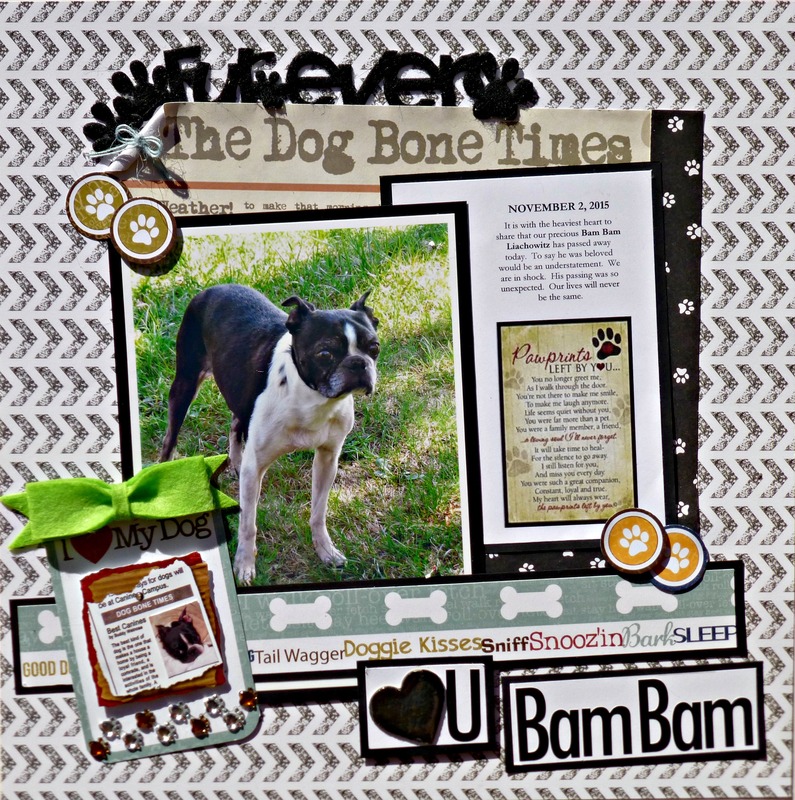 I really love what you did with the dog newspaper print - I have that pp and I pull it out and put it away everytime I do a doggie page - no clue what to do with it - but you have given me some great ideas! Beautiful tribute! I love the patterns and design! This is such an amazing tribute to their dog. It will mean the world to him. Well done. What a caring and thoughtful gift for them! Lovely creation, I'm sure it will be treasured! Great tribute to a beloved pet. So cute, I'm sure your brother loved it! So precious! Brought a tear to my eye... wish our fur-babies could outlive us! What a beautiful and heartfelt gift! So precious! Cute layout. Love the little paw prints. Such a sweet tribute page! Wonderful page. What a great tribute for them to have. I am sorry about his dog, Bam Bam. Love that name. 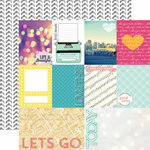 This is a beautifully created page, it will look great in a shadow box. I really love that everything is at an angle, inspiring idea. Fantastic page, love the layers, what a beautiful heartfelt gift! They are going to love it!! How sweet and thoughtful you are! So sorry for their loss but I know they will treasure this precious page! Wonderful layout and so special gift!! awe. This is sooo sweet. I am sure they will treasure this. Plus its just a darn good LO. It's gorgeous Marci! They will treasure it!! love your work! Wonderful gift for him! Sorry for his Loss! Beautiful LO! what a great page, and a sweet tribute. It's so sad when a loved furbaby passes. This is really special! Beautiful lo! What a great tribute ! I am sure your brother will appreciate it! So sad story and so wonderful page! oh no . . . it's always such a heartbreaking experience to lose a furbaby. You've done a lovely job with this sweet tribute. I am sure your brother will treasure this. Such a sweet tribute page and great design, love the embellishments and title...I'm sure he'll love it. such a touching page Marci! It was so nice of you to think of them with this tribute. Heartwarming tribute page for your brother. Sorry for the circumstance but I am sure that this LO will be treasured. I am so sorry to hear about BamBam. What a beautiful page. Our Boston Terrier is like a family member. so I know BamBam will be sorely missed. How sad...my sister just put down her Golden last week...it's definitely heart wrenching! The lo is awesome...love the photo! I'm sure that he will appreciate it! Aw Marci, that's so sad. You've done such a beautiful job of this tribute page though; I'm sure it will be very much appreciated by BamBam's family.